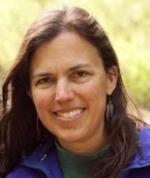 Karen Holl is one of the authors in an award-winning study that explores the use of drones in forest restoration. 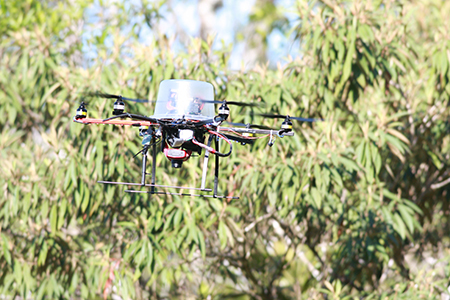 Drones could monitor the success of forest regeneration in the tropics, suggests a new study published in Biological Conservation. The researchers say automating the monitoring process leads to equally accurate results and could save a significant amount of time and money. The new research has been selected by an international scientific committee to be given the Atlas award. Between 1990 and 2005, the world’s rainforests were depleted by more than 8% through deforestation, in part to make way for agriculture. Today, large areas of agricultural land are being restored to rainforest to meet conservation goals in the tropics. It is important to monitor the success of these efforts to ensure that these areas are replenished with the right vegetation. There are many drivers for conservation efforts, including governmental subsidies, and many of the people implementing the projects are individual land owners. Monitoring regeneration can be labor intensive and expensive, making it difficult to know whether conservation efforts have been successful. However, using unmanned aerial vehicles – or drones – to replace manual monitoring under certain conditions could save considerable costs, making the monitoring process more feasible for scientists. Traditionally, rainforest regeneration has been monitored manually. This requires skilled, knowledgeable people and specialist equipment, and can be especially challenging if the land is difficult to access. An alternative to manual monitoring is LiDAR – remote sensing technology that analyzes reflected light. 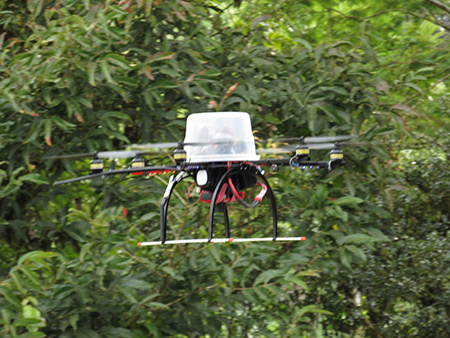 However, a single LiDAR flight to monitor forest recovery remotely can cost upwards of $20,000. In the new study, Dr. Zahawi and the team, including researchers from the University of Maryland and the University of California-Santa Cruz, USA, tested a new automated approach to monitoring that doesn’t involve manual intervention. Using inexpensive drone-based remote sensing technology, the researchers measured the structure of the forest canopy across a series of 1-hectare regenerating fields that were previously agricultural land in southern Costa Rica. The land is part of a long-term tropical forest restoration study. The drones were fitted with a simple 10 megapixel point-and-shoot digital camera and use open-source software to process these overlapping images. The camera takes thousands of photos and the “Ecosynth” methodology then creates 3D images called point clouds that represent the vegetation. In total, the drone and camera cost US$1500 – less than a tenth the cost of some equivalent flights. The researchers compared the results produced by Ecosynth for canopy height, above ground biomass and canopy structure – whether the canopy was rough or open – to field based measures. They also evaluated whether Ecosynth-measured canopy height could predict the abundance of fruit-eating (frugivore) birds as accurately as field based height measures; many fruit-eating birds, such as the mountain thrush, black guan and sooty-capped bush tanager, are important for forest regeneration. The results showed that Ecosynth was as accurate as human monitoring, although there were some errors when the canopy was low. 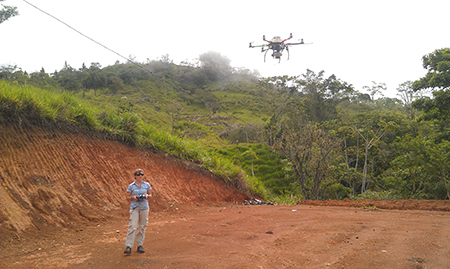 The article is “Using lightweight unmanned aerial vehicles to monitor tropical forest recovery,” by Rakan A. Zahawi, Jonathan P. Dandois, Karen D. Holl, Dana Nadwodny, J. Leighton Reid and Erle C. Ellis (doi: 10.1016/j.biocon.2015.03.031). The article appears in Biological Conservation, 186 (June 2015) pages 287–295, published by Elsevier.